The Extra Large Predator Plastic Alpha Dive Flag meets the minimum legal requirements for commercial vessels in survey. Let everyone know you are conducting diving operations with this extra large blue and white, divers below, Alpha Flag. This Flag is the international signal A (letter ALFA/ALPHA), used to indicate the presence of a diver in the water. The 'A' flag is required to be displayed by any vessel engaged in diving operations, when restricted in her ability to maneuver, required by the International Rules for Prevention of Collisions at Sea (IRPCS) Rule 27. 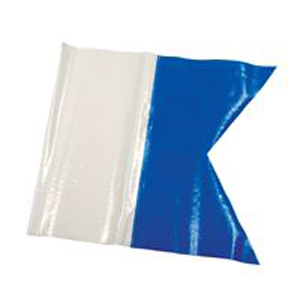 The Predator Plastic Alpha Dive Flag is made from durable plastic. It has a stitched section on one side to insert a flag pole. The thick plastic material makes the flag stand out erect even if there is no wind rather then collapsing around the flag pole like other brands.